It’s not easy to learn how to become a bartender with no experience. People that fall into this group are the ones that want to break into bartending or the bar / restaurant industry. They have worked in other jobs, maybe retail or office work previously, but want to enter the fun, exciting and well-paying world of bartending. If you fall into this category, you should know from the onset that it’s not going to be easy to get a job bartending. It’s not impossible, but it’s not easy. If you fall into this group, you MUST be outgoing, personable and like people. If you aren’t, why do you want to get a job as a bartender? If you’re usually the life of the party, like to be the centre of attention and were always the funny person in class, you should make a great bartender. Bartending skills and drink recipes can be learned. People skills are harder to teach someone. Get a notepad and go to a bar – one that you could see yourself working at, and order a drink. Open up your notepad and start making notes about all the skills and personalities of the different staff. You’ll want to make note of their customer service skills, how outgoing or personable they are, how they interact with customers, what they say to you when they take payment for your drink and return your change. You’ll want to notice things like what they do when they are not busy. Do they re-stock supplies? Do they wash or polish glassware? Are they sweeping or mopping the floor, cleaning the bar top, wiping down fridges? Are they chatting with customers – entertaining guests? Make a big of a list as you can about everything that the bartender(s) does. So, how long have you been bartending? I’m thinking about getting into bartending, what advice would you give someone just starting out? Do you have any stories about bad customers? Like a really tough customer you’ve had to deal with and how you handled it. What would you say are the negatives about bartending? So, what’s great about bartending? What do you love about it? You want to ask as many questions about the bartender and how s/he got into bartending as possible. Anything you have ever wondered about bartending, nows the time to ask. 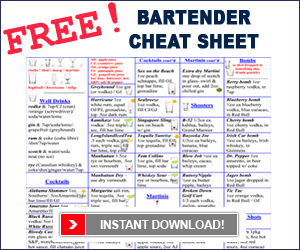 You now have several pages of notes on everything from the skills you saw the bartender employ to the personality traits exhibited by the bartender. And, you have answers to all the above questions about the pros and cons of bartending and how to get started as a bartender. Now go home and get your resume out. With your notes from the bar in hand, start going through your resume and pinpointing skill sets that are transferable from your previous job to bartending. So if you had a job as a cook at McDonald’s, you’ll want to highlight cleanliness. If you had a job as a cashier at a retail clothing store, you’ll want to highlight money handling and customer service skills. If you had a job as a janitor, you’ll want to highlight time management and cleanliness. Almost any job in the world has something that can be transferred to bartending. You hopefully already have customer service skills from a previous job or you know what’s expected in this area. Now’s the time to get the other two that you’re missing. Pouring skills are important because if you don’t know how to pour mixed drinks and beer, you’ll be a mess behind the bar. So you need practice. Practising pouring mixed drinks is something you can do at home pretty easy. The beer will have to wait until you get the job. You’ll want to go to a restaurant supply store and pick up a metal pour spout and a jigger. Then find an empty bottle of alcohol. If you can’t find one, go buy a 26oz bottle of booze, call a bunch of friends, throw a party and make drinks for them. Now that your bottle is empty, fill it up with water – you’re going to start practising pouring. Grab two or three glasses from your cupboard and find an area in your house – hopeful somewhere where the height reaches between your waist and your chest. Place the two glasses on your makeshift bar, grab your bottle in your hand, placing your index finger over the edge of the pour spout. Grab the jigger in your other hand and start practising. At the beginning, just pour one shot and stop. Stop the pour by turning your wrist inwards towards you, cutting the pour off. Once you are comfortable with this action, practise pouring two shots at once. Pour the first one and when you reach about a third of an inch (1cm) from the top of the jigger, pour it into the glass but keep pouring the liquid into the same glass as well. Quickly bring up the jigger and start filling it for the next glass. This time cut the pour when the jigger is full and then pour the shot into the glass. Okay, now you have the customer service skills and basic pouring skills it takes to be a bartender. Now it’s time to learn some drinks. It’s a myth that every bartender needs to know a gazillion drinks to be proficient behind the bar. If you want to know how to become a bartender, at most, you’ll need to know 30 drink recipes. Out of those 30, about 20 of them will be standard drinks and the rest will be local or bar specific specialties and shooters. Once you’ve memorized the drinks in the above list, you’ve got your pour skills down pat and you’ve paired up your previous job skills with that of a bartender, it’s time to get your resume ready. Although you may now know a bunch of drink recipes and how to pour mixed drinks, the manager isn’t going to know that looking at your resume. So, it’s time to craft the perfect cover letter. Since this is the only way the bar manager or owner is going to know what you know, take your time here and make sure that you accentuate your transferable skills and your drink knowledge. Mention that you know you don’t have hands-on bartending experience but that you’ve bartended events / parties (remember when you bought that bottle of booze to practise pouring and threw that party for your friends) for friends and family and you know the top drink recipes. Talk about how you may not have experience in a bar but that you’re comfortable behind a bar and would love the opportunity to come in and discuss your qualifications further. You may also want to mention that you are willing to start at the bottom and work your way up. Many a bartender started as a barback or runner, learning the ropes first before being promoted from within to a bartending position. Barbacks get tipped out and are able to make good money at busy establishments. Plus, its an excellent way to get experience and to show the bar owner / manager that you’re serious about doing what it takes to become a bartender. And that’s all you need to know about how to become a bartender.